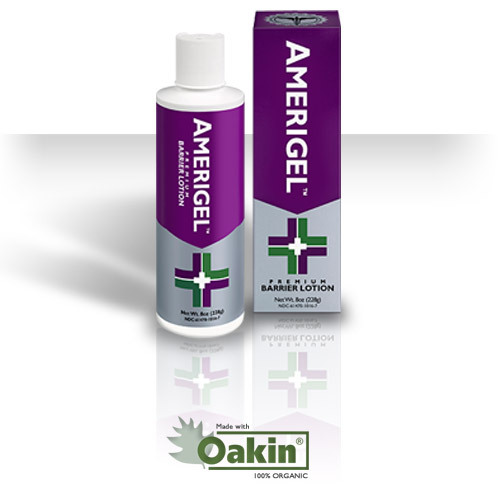 Amerigel® Barrier Lotion, a skin protectant with the proprietary agent Oakin®, shields and lubricates skin from irritations caused by shear damage, friction, excess moisture, skin irritants, bacteria and fungus. Oakin®s natural antimicrobial, antifungal and anti-inflammatory properties work to fight against infection while the Dual-Dimethicone formulation provides an invisible shield for advanced skin protection.This non-greasy, non-occlusive formulation protects skin from prolonged exposure to excess moisture in cases of incontinence and macerated periwound skin and minimizes chafing from friction caused by prosthetic devices, skin folds and wound care dressings. Get maximum skin protection and easy application and removal with Amerigel® Barrier Lotion.